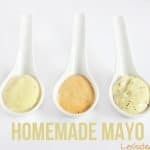 Homemade Paleo Mayo is so easy to make, using a handful of ingredients you likely already have on hand and made in under 5 minutes! Have you ever read mayonnaise ingredients? It can be so hard to find one without canola oil or soybean oil. Good thing homemade is super easy! And it tastes to amazing compared to anything you’ll find in the store–it’s creamy, flavorful and improves any dish it is used with. What is your favorite use for mayo? Right now, mine is different variations of chicken salad such as this Apple Dill Chicken Salad. Add egg, lemon juice, mustard, salt and and pepper into the blender basin and turn on until combined. With motor running very, very slowly add the oil in in drips until the mayo thickens. In a food processor, pulse the egg, lemon juice, mustard, salt and and pepper until combined. With the machine running, very, very slowly drip in the oil until the mayo thickens. Taste and add additional salt if desired. While blender is on, very, very slowly drip in the oil and blend until the mayo thickens. Thank you so much for the mayo recipe (and egg oveview!) – All the mayos here in Australia are filled with 20+ ingredients! I just started using an immersion blender for mayo, and was amazed at how much faster it is. Thanks for including my recipe! 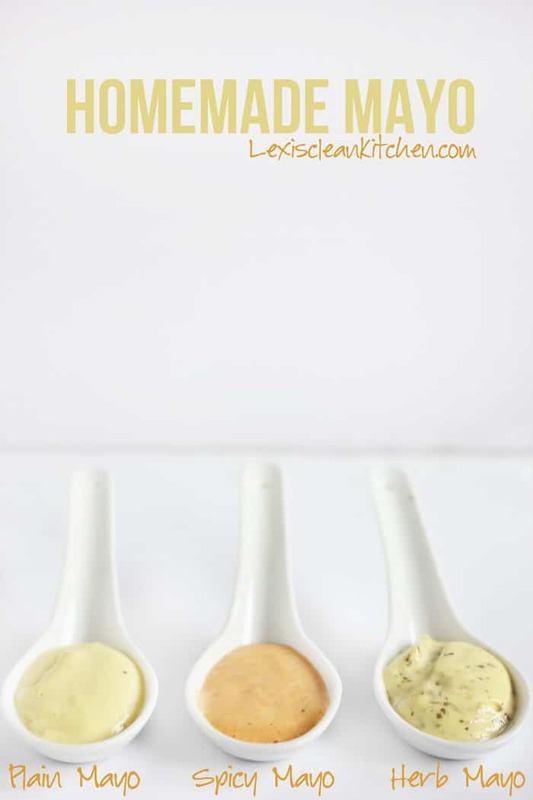 Love this post, especially the wonderful recipe for a nice, clean, homemade mayo and the lovely flavor variations (yum – sriracha :D)! Great tip on the immersion blender, too! Using a bit of baking soda when boiling eggs, makes for easy peeling? Wow! you learn something new everyday. Thanks. I just made my first batch of mayo, I do not have an immersion blender so I used my nutri bullet. My mayo is real watery…I’m going to put in fridge and hope it will thicken up. Do you think it was because of me not using an immersion blender that its on the thin side? Help!!! Since you would be unable to stream the oil into the mix with a nutribullet, I imagine that it wouldn’t emulsify well which would cause the wateriness. Can you tell me how many tablespoons the mayo recipe makes? If I do not have an immersion blender, what can I use instead? Apart from the baking soda trick, your boiled would peel easily if you run cold water over it for a minute or two. I would definitely try out some of your recipes this weekend.